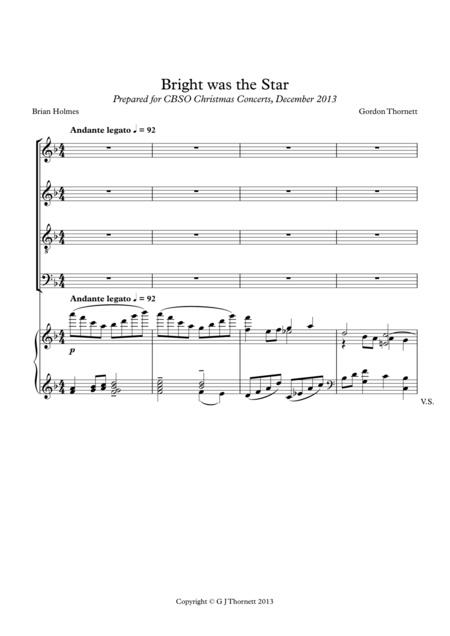 Composed by Gordon Thonett. Christmas. 10 pages. Published by Gordon Thornett (S0.18878). This simple Christmas setting resulted from an international collaboration between Brian Holmes of California and Gordon Thornett from the UK. 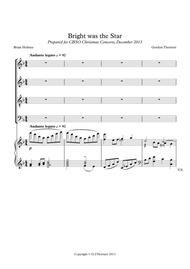 Brian's poem has been set for mixed voices (SATB) and piano (or organ). The piece describes how the cold of winter is turned into spring by the coming of the Christ Child. "Bright was the Star" received its first performances in the UK, by the City of Birmingham Symphony Orchestra and CBSO Chorus, conducted by Simon Halsey in December 2013. The orchestration is also available by arrangement with the composer.